Now the hall tickets for the eligible candidates are available on the official website, and they can be downloaded from the below given link. 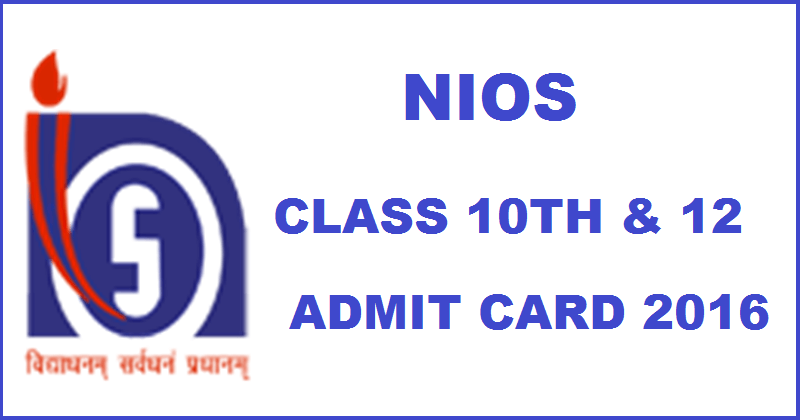 The NIOS has been formerly known as National Open School (NOS) and later it has been updated. It has been established in 1989 which offers several courses along with general and academic courses at the level of secondary and senior secondary levels. Like every year, the schedule for class 12th and 10th examinations have been revealed out, and now the hall tickets too can be downloaded from the official website www.nios.ac.in. The aspirants who have been waiting for the hall tickets have now a good news, and they can get then downloaded. The National Institute of Open Schooling have made it mandatory for the students to carry the print copy of the hall ticket to the examination room without fail, and those who do not produce their hall ticket will not be allowed to write the examination. The hall ticket has the complete information about the student and his class along with the roll number and the examination venue. The examinations for 10th class students will be held from March 31st till April 28th this year, and the exam timings will be from 2.30 PM to 5.30 PM. The examinations for 12th class students have been scheduled from March 29th to May 6th and the time of the examinations are from 2.30 PM till 5.30 PM. The practical examinations for the students will take place from March 14th to March 27th this year. 1.Visit the official website www.nios.ac.in. 2.Please click on the respective class admit cards 2016. 3.Enter the full hall ticket number and click enter. 4.The admit card will be displayed on the screen which can be verified. 5.Please click on Download and take a printout of the hall ticket.